With the bounty of fresh produce from farmer’s markets and gardens, veggies are plentiful this summer. Recently, using a summer squash, zucchini and some imagination, I came up with this recipe and may I say – it was fabulous. The combination of fresh herbs, grilled squash, sweet sautéed onion, creamy goat cheese and a burst of fresh lemon make this a new favorite for Spence and I. Step One: Slice the squash into 1/2-inch “planks” (on the diagonal). Lay the planks on a paper towel, season with salt, pepper and garlic seasoning on one side. Brush a grill pan generously with coconut oil and bring to a searing heat. Place the planks on the grill pan, flipping only one time after 2-3 minutes (you’ll see grill marks). Allow another 2-3 minutes of grill time, remove and place the planks into a baking dish in a single layer. Step Two: Saute the onion in butter on a medium heat for 4-5 minutes. Top the squash with the onions. Step 3: Heat oven to 350 degrees. 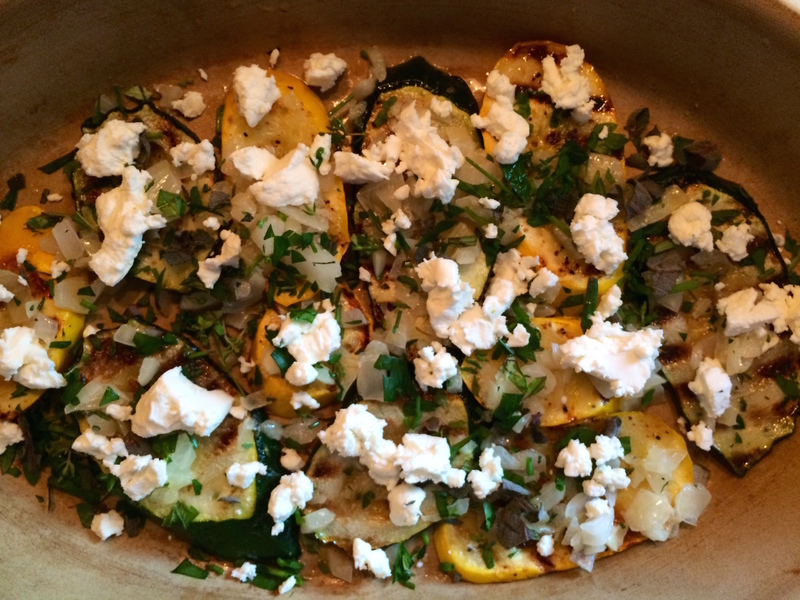 Top the squash with chopped herbs, followed by crumbled goat cheese. Squeeze fresh lemon over the top. Bake for 10 minutes – just to soften the goat cheese. Top with red pepper flakes and serve. Note from Spence’s Girl: I purposely left the recipe without quantities as you can adjust based on how many servings you’d like. If you don’t have access to these exact herbs, use what you have – basil, oregano, tarragon – have fun with it. While not vegan, this would be a lovely vegetarian entree. * To calculate the Weight Watchers Smart Points, I used 1 oz of goat cheese and 1/2 tablespoon of butter, based on 2 servings. Just picked up some summer squash at the farmers market. This looks absolutely delicious! And I like the free-form recipe. I rarely measure out exact amounts. I’m so glad! That’s my style of cooking for sure. Just “create” with what sounds yummy!